More people in London voted to leave the European Union than voted for Sadiq Khan! People are dying on our streets while the Mayor of London is busy projecting the EU flag onto the London Eye. Sadiq Khan needs to stop playing politics and get a grip. A very xenophobic message from the Mayor of London. He only wishes a Happy New Year to the one million mainly white EU citizens in London. How DARE he completely ignore the TWO MILLION people from OUTSIDE the EU who have ALSO made our city their home?! Last edited by Blackleaf; Jan 1st, 2019 at 11:45 AM..
You must knuckle under to the no ballist knife wielding commie vegetable colored woman's lib burka nazis! Just wait till those burka wearing immigrants all turn into total ninjas and take the crown for a paper weight. Sadiq Khan will help them. He's close buddies with one or two Islamist organisations. Last edited by Blackleaf; Jan 3rd, 2019 at 03:13 PM.. 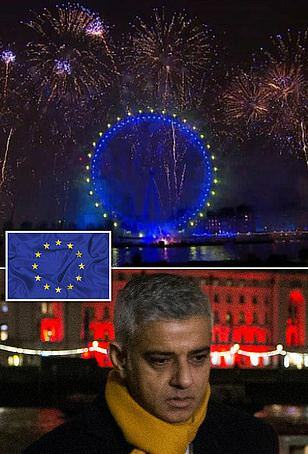 The London mayor’s pro-EU firework stunt exposed his authoritarian streak. Now we know what mayor of London Sadiq Khan really thinks of the city he oversees. He sees it as his personal fiefdom. A one-man principality. A city whose every edifice and event must be stamped with his political prejudices lest the baying millions who live here forget who is in charge. This is what the mayor’s artless, cynical twisting of the New Year’s fireworks display into a pro-EU propaganda spectacle tells us: that Sadiq rules London in a monarchical style, viewing every public event as an opportunity to make a political speech and to hector and troll the city’s masses. Sadiq’s wheeze was to turn the London Eye, the centrepiece of millennial London, into an EU flag. He had it lit up in blue and surrounded by small blasts of yellow, mimicking the EU flag. To drive the point home he tweeted a photo of the Eye – clearly proud as punch of his Maoist spectacle – alongside the words, ‘Tonight’s spectacular #LondonNYE fireworks showed that whatever the outcome of Brexit – #LondonIsOpen’. ‘Tonight’s fireworks showed’ – did those words not give him pause for thought? Did he not stop to think that a New Year fireworks event is not meant to show anything other than bright colours and loud noises that make people say ‘Oooh’? Did he not wonder if his politicisation even of something as joyous and uniting as a New Year fireworks display might just put him in the same camp as old-style emperors who held huge games to remind the plebs of the emperor’s power or more recent tinpot tyrants who organise spectacles, whether of the military, political or sporting variety, to dazzle the little people and remind them who’s boss? It’s remarkable that nobody in the planning stages of this crass stunt said to Sadiq: ‘Should we really do this? Use one of the largest events in the calendar of the capital city to mock the majority of Britons? To sneer at the country at large about their opposition to the EU?’ Or maybe someone did and Sadiq, in keeping with his increasingly Macron-like, Jupiterian style, just shut them down. Imagine how out-of-touch Sadiq’s coterie must be that they thought it would be a hoot to turn one of the UK’s most significant public events of the year into an assault on the public, into a two-finger salute at the largest electoral bloc in British history. It was a metaphorical spitting at the plebs. Sadiq and his equally aloof minions seem to have forgotten – or perhaps they don’t care? – that Brexit has more support in London than Sadiq does. More than 1.5million Londoners voted for Brexit in June 2016 – 40 per cent of the city’s voters – compared with the 1.3million who voted for Sadiq in May 2016. Yes, Brexit is such a huge, unprecedented political phenomenon that even in the supposed ‘Remainer city’ of London it enjoys more backing than the city’s own mayor. What is Sadiq saying to this Brexit-backing swathe of Londoners when he prostitutes even London’s end-of-year party to his obsessively Brexitphobic cause? He is saying they don’t matter. He is saying, ‘**** you’. Indeed, for all the Sadiq clique’s propaganda about London being open, complete with multicultural, multi-religious adverts, the mayor clearly is not open to Brexiteers or to democracy itself. Brexit London is the forgotten London. Places like Havering and Hillingdon and Barking, alongside Brexit-voting areas in north-west London and south-east London – the mayor and other Remoaners don’t care about these places. What, with their vulgar, borderline Essex inhabitants, and their Daily Mail readership, and their penchant for flying the St George’s flag in their windows? No thanks. That isn’t the real London, in the view of Sadiq and Co. The real London is Remainer London, the posh suburbs and the inner-city areas and the City of London: that’s real London, good London, the London that deserves a New Year’s Eve fireworks display. Sadiq’s stunt fits into a New Year pattern among the bruised technocrats who unfortunately still rule over us. It stands alongside President Emmanuel Macron’s nasty New Year speech in which he denounced the massive Yellow Vest protests as homophobic and fascistic. And it is of a piece with Keir Starmer’s New Year wishes in which he expressed his hope that populism – that is, political ideas that are popular – will be defeated in 2019. We’re witnessing a technocratic fightback, the collective squawk of an elite that fears its number is up. Bring it on. You can have your political stunts and your anti-masses spectacles – we still have our votes and we know just what we’re going to do with them when the time comes. You want a fight in 2019? You’ve got it. With friends like this, is Sadiq Khan fit to run London?